Slade Wilson himself, Joe Manganiello, has confirmed that the Deathstroke solo movie is still in the works over at Warner Bros. Last October, it was revealed that the studio were developing a standalone film for the anti-hero mercenary, with The Raid’s Gareth Evans attached to direct. Since, then, however, the DC Extended Universe has undergone a bit of a restructuring, so we weren’t sure if the project was still doing the rounds at WB. This is reassuring for fans of DC’s assassin, nicknamed the Terminator. Manganiello was initially cast for a major role in Ben Affleck’s The Batman, presumably acting as the main antagonist. However, since Affleck stepped down as director and Matt Reeves was brought in, Deathstroke’s part in the proceedings has been left unclear. Especially considering Reeves has restarted the project from scratch. Manganiello did get to make his big screen debut as the character in last November’s Justice League and though much of the film was considered a disappointment by many, the second post-credits scene definitely wasn’t. The sequence saw Lex Luthor summon Slade Wilson and pitch to him an idea to form a united legion of super-villains – “a league of our own,” as Luthor put it. This could allow the character to appear in a number of future DCEU movies, as he recruits other villains to join Luthor’s gang. Specifically, some have theorized that Wilson could show up in Suicide Squad 2, which is set to go before the cameras later this year. 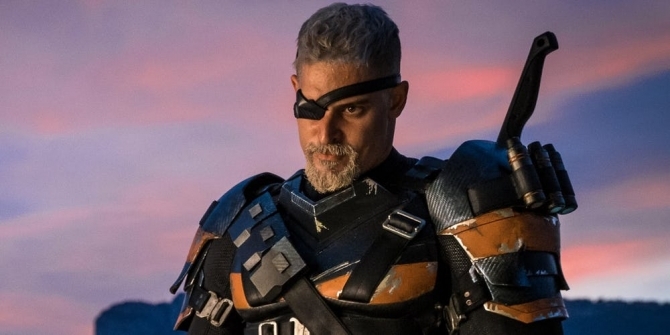 Whatever’s next for Deathstroke, it’s clear that WB have plans for him, as The CW’s Arrow has allegedly been banned from using Slade for the time being.